I think it’s safe to say that we all hate to be the one pulling out the guidebook on any excursion. Whether on the move for 48 hours or 48 days, nobody wants to be immediately recognized as a tourist. We’d all like to blend in a little, at least where it’s possible. First thing’s first: a guidebook that doesn’t look like a guidebook. 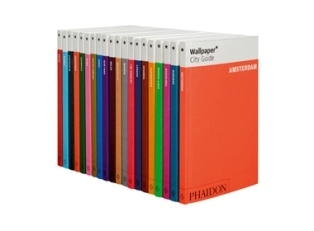 City Guides from Wallpaper are packaged so discreetly that they look more like novels than guidebooks. Why didn’t anyone think of this before?! Currently offered on wejetset.com for seven cities including Barcelona, London, New York City, Paris, Tokyo, Toronto, Berlin, these guides also happen to have a ton of useful information. These are the perfect gift for any world traveler! You manage to not look like a tourist and to really get to know the city. An all-around good deal. And at $8.95, much more bang for your buck. Wejetset.com offers an astonishing array of great travel finds, including luggage, headphones, notebooks, foldable bikes, and tons more. Be sure to check it out!